Well thank for you all clicking on my link in The World newspaper - my blog was the most read item on last week's site. I finally cracked and complained to the PCT and my consultant in Birmingham has also spoken to the practice manager. Watch this space....and maybe the newspapers. They also wouldn't give me a vile of blood to send off to Newcastle without a proper blood container, which is fair enough, so I am awaiting one from up north. Am almost up to where I was before the shingles with the swimming and the Wednesday lunchtime table tennis is good fun - if hard work. Anyway. 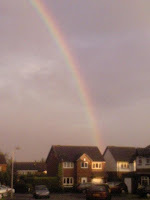 There was a lovely rainbow as I walked down and lots of rain as I walked back. It was good to catch up with CM....She was the first person I ever met in Widnes! On Sunday I went to see a team of Aston Villa Old Boys play Burntwood Dragons at B'Wood Rugby Club. I played table tennis on Wednesday lunchtime for the first time since the lungs started rejecting - it was only for 40 minutes, but I felt good for having done it. The next day was an open evening at the local TT club at Halton Stadium - so I gave it a go. I was paired with a 12-year-old, they didn't tell me he was also an England youth player. Doh! An hour later I sat in the changing room, and sat....and sat.....and then the same in the sauna. About an hour later I was recovered enough to drive home. I had Friday off because Sarah was coming over - in the end her train didn't get in til about 7pm. I cooked my favourite steamed fish and veg stuff and we just vegged. I tried to persuade her to go for last orders somewhere...But the Friday Night Project was on TV! Then the do was in Ravenglass a cute fishing village and Sarah and I were part of just one table of 'friends' - the others were relatives. I don't think Cumbria has seen so many Sri Lankans! I am really a friend of a friend of the bride and was S's (plus one) and had only met her once! When I went swimming this morning I think I was still sweating Champagne - well that's MY excuse why the water went all bubbly when I got it! PS: People have asked why the tunes I created haven't been updated for while. Well I have been without my laptop for a few weeks. But I have ordered a new one now...Patience! It was the third anniversay of dad's death so it was good to get out! I went to the gym on Saturday at the stadium for my physio - it has been revamped and is lovely sparkly and new.... Everything smells like a new car. I certainly knew I hadn't been doing exercise for a couple of weeks. Never mind. No I am not infectious I will try and swim this week. In the evening I went to Chester Racecourse to see a showcase of bands including Hot Club De Paris (rubbish) Vincent Vincent & The Villans (ok) Six Nation State (excellent) and Landaus (good).. I was there with Dave (an old college chum) and the Chester massive (!) - ooh look at me talking like a yooof. There was also a v.drunk Liza there - who is always very funny after a few drinks. We ended up in an private members club called 'Politic' ran by someone called Neville Sidebottom - who is younger thatn his age suggests. The problem is that I am feeling my age. My pedometer reading shows that I did virtually nothing on Sunday. A night drinking punished me for days! Anyway. Back to work on Wednesday but I had an eye test in the morning. It was strange, they put drops in your eye to make it look as though one is on 'e'..
Then on Friday I had my outpatients appointment in Heartlands..But typical they tried to use the wrong machine to test my lung capacity.... I seem to be travelling all over the country for the pleasure of being prodded and poked! 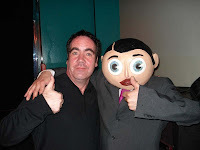 Friday night Ian and I went to see Frank Sidebottom in Wolverhampton - and met the great man. It was the only gig I have been to where you get food at half-time and the act raffles off the props. On Saturday I had all good intentions of going into Stafford. But the kittens were demanding attention and who was I not to give it to them? In the afternoon I went to visit the lovely Bekkkkkkkah at 'Fleur' in Stone, her last day working at the place and went back to see her boat. They live in a lovely spot by the canal and even have a signal box in the garden.. WoW! V.cool. In the evening I went to the Griff boys' dad's 50th - it was funny. They gave speeches and the only thing they could find their dad had done funny in 50 years was kick a ball against a fence... Andy Griff is meant to be a law peronsage - I hope he sums up the cases better than this! 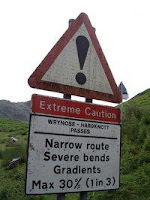 Then headed back to wonderful Widnes - Gosh I itch and its not just the chemicals!